RF rotary joint union PE1401 from Pasternack is manufactured to precise radio frequency component standards for applications such as rotary antenna systems such as air traffic control radar, air radar, ship radar, vehicle radar, other rotating radar antenna applications and more. This radio frequency rotary joint design is constructed with SMA connector to PCB connector. This SMA to PCB rotary joint for RF uses a female for side 1 and a pin for side 2. Our "SMA female to PCB pin" precision RF rotary union joint has maximum frequency of 6 GHz and a maximum VSWR of 1.15:1. Our rotary joint for radio frequency applications like rotating radar antenna, has an average rotation speed limit of RPM. 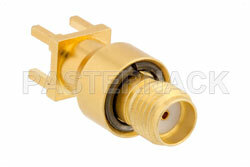 PE1401 SMA connector to PCB rotating RF connection joint is part of more than 40,000 RF, microwave and millimeter wave components supplied by Pasternack. 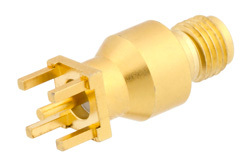 This RF union rotating connector joint is in-stock at our ISO 9001:2008 facility in Irvine, CA. Pasternack Enterprises is where to buy your rotary joint components for same day shipping throughout the United States and internationally, as with all other Pasternack RF parts.